Using public transit in the Portland-Vancouver region just got even easier for tech-savvy riders. 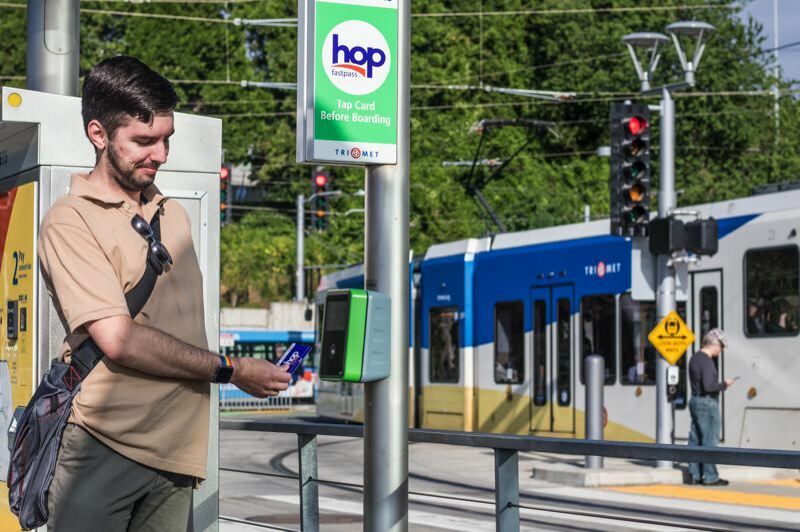 In addition to being able to pay fare with a tap of the news Hop Fastpass cards, riders can also just tap their smartphones to pay using a mobile wallet app with a linked credit or debit card, TriMet announced Wednesday. Phone taps can be used to purchase adult fares only, but like the Hop cars, they can be used on TriMet and C-TRAN buses, MAX light rail trains, WES commuter rail trains, the Portland Streetcar, and C-TRAN's Vine Rapid Transit. Riders only need to tap their phones against the target on the reader each time they board. Paying by phone can save money, too, TriMet says. Once a phone is tapped for two district trips (more than 2 ½ hours apart) within a service day, the rider earns a day pass and the rest of the day's rides are free. Unlike Hop cards, however, the same is not true for a monthly pass. 1. Check your phone to see if it is equipped with a mobile wallet. If not, download one from your app store. 2. Link the mobile wallet to a credit or debit card. 4. Watch for the confirmation screen (or listen for the ding) to assure your fare is valid. 5. Remember to tap each and every time you board, including transfers. All TriMet riders are still required to provide proof of fare, including those using Hop cards and their smartphones. Fare inspectors have new equipment that allows them to scan a Hop card or phone to determine whether fare is valid. That's one more reason for riders to tap every time they board. If using their phone , it should be kept handy and charged. TriMet has been working with systems partners since 2014 to develop the $34 million Hop Fastpass system for several reasons. It is expected to reduce fare evasion and costs associated with ticket vending machines, cash purchases and collection processing. It is also expected to speed boardings to help buses and trains stay on schedule.